Localizado em South Bowers Beach Island diretamente na praia e localizado no ponto mais largo da Baía de Delaware, cerca de 28 quilômetros em frente a NJ, esta ilha casa oferece algo muito especial que os grandes resorts não têm paz e sossego. Passo à direita na areia desta bela casa de praia. Se a pesca é sua coisa, lançar sua linha na água e peixe fresco são seus para o café da manhã ou jantar, licença de pesca necessária. Você pode colocar seu pequeno barco ou caiaque na água da praia e explorar os afluentes locais, onde você encontrará não apenas a serenidade de uma paisagem selvagem, mas também muitas espécies de peixes e caranguejos. As crianças podem andar de bicicleta na tranquila estrada da ilha, andar de patins ou brincar na praia, colecionar conchas e copos de água do mar e se surpreender com o local de caranguejos-ferradura pré-históricos que migram para esta região da América do Sul. Linhos não estão incluídos no seu aluguer ... eles estão disponíveis por um custo adicional. A estrada está sujeita a inundações das marés. Existe um aplicativo disponível para telefones celulares chamado Tides Near Me (é grátis). Depois de abri-lo, escolha Delaware, Milford, Mispillion River Entrance. Ele lhe dará as melhores informações sobre a maré. Veículos de alta folga recomendados. The minute we walked in we knew we wanted to stay longer! Beautiful! Clean! The views are amazing! Private! More than we expected! 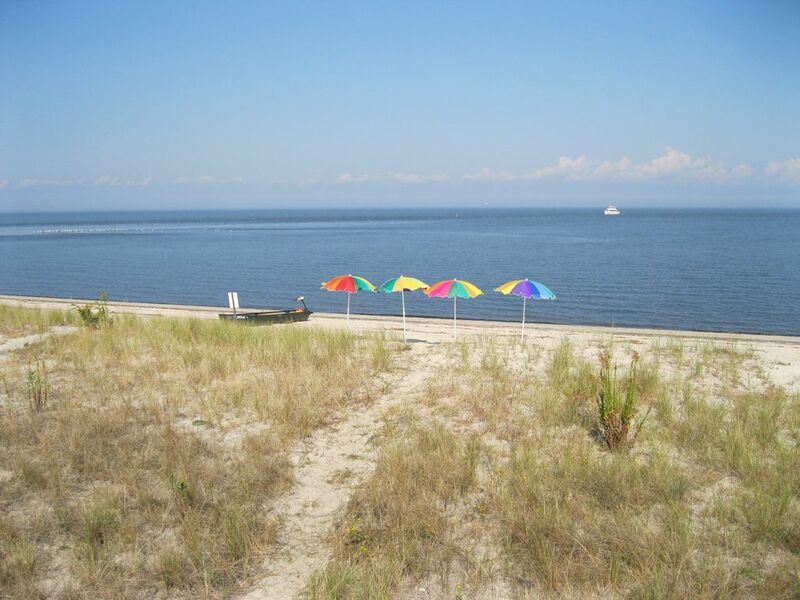 The Iguana House is the perfect getaway on the Delaware Bay. The property is very well maintained and the kitchen is designed for cooking and enjoying those you brought with you. We like going in the winter when the beach is all ours and the migrating flocks of birds provide spectacular displays at dawn and dusk. Easy access to the main highway but everything you need to vacation is right there at the house. I was looking for a weekend away from everything and everyone. This worked perfectly. I was there in December, so I'm sure there is more activity with several surrounding houses during warmer months. Nice house, well appointed and I really enjoyed my time there. Patrick, the owner, was very responsive and made sure I was fully set up. I will return at some point for sure! Wonderful place to spend a weekend getaway! Five girlfriends spent a quick but wonderful weekend at this house. Although we weathered a nor'easter and found ourselves temporarily stranded, the house was so cozy, it didn't seem to matter. The following day, none of us wanted to leave. We are already in the planning phase for next time. Thank you to Patrick for this beautiful escape! We were just looking for a quiet getaway for a couple nights and The Iguana House fit the bill. It’s a beautiful house directly on the beach on a quiet road, but accessible to restaurants, shops etc. We look forward to our next trip. We can't say enough how much we enjoyed our stay at the Iguana House. It was our first time at a Delaware beach, and you never know quite what to expect when trying somewhere new ... well, we LOVED it! The beach was SO private and tranquil ... other than the delightful neighbors and another family or two we'd see sometimes on the beach, it felt like the beach was completely ours. We loved taking long morning walks picking up sea glass and knobbed whelk shells, and we were delighted to see baby terrapin turtles making their way down to the sea! As far as the house itself, the pictures and listing don't do justice to how beautiful it is. We expected it to be clean and well-equipped based on the pictures, but we didn't expect it to be SO beautiful on the inside as it is. Everything was extremely comfortable, and we didn't want for anything. We're already talking about coming back next year and making this "our" place!